Plumeria care is easy as long as you can meet its needs for warm sunshine and humidity. Vigorous and a prolific bloomer, Plumeria rubra makes a beautiful potted houseplant. Thick, woody branches carry pointed leaves that grow up to 1 ft (30 cm). Big clusters of fragrant flowers grow like bouquets on branch tips from early summer through fall. Frangipani flowers are each made up of 5 overlapping petals. 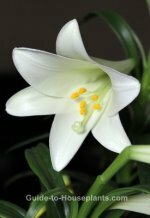 The waxy blooms are about 2 in (5 cm) wide and are available in many shades of pink, red, yellow or white -- or any combination. This Central American native prefers bright light and moderate humidity. 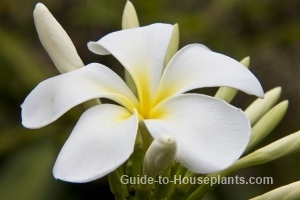 If you can give plumeria care that it needs, you'll enjoy this spectacular tropical plant in your home for many years. Let the sun shine in. Plants that don't bloom aren't getting enough sun. Growing plumeria require at least 5 hours of direct sun each day. Repot young plants in spring when their roots have filled the container. Move it to a pot only one size larger. When planting plumeria, care should be taken to choose a pot with drainage holes to prevent root rot. Is it too big to repot? 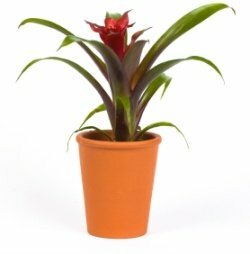 You can top-dress it instead by removing the top 2-3 inches of soil and replacing it with fresh soil. Cut at a 45° angle, just below a node (the place where a leaf or branch is attached to the stem). Use sharp pruners to avoid tearing the stems. Prune it back. You can control its size and encourage it to branch out by regular pruning. Flower clusters grow from the branch tips, so you'll get more flowers this way. Cutting plumeria branches back by 1/3 won't hurt it at all -- this is a vigorous plant. Prune in late winter or early spring. Give it a winter rest. Frangipani tree will go dormant in the winter months, shedding its leaves and requiring a cool rest. Put it in a cool room -- a basement or garage is ideal as long as the temperature doesn't drop below 55°F/13°C. Water sparingly and stop fertilizing until new growth begins in spring. Although it's called a frangipani tree, this tropical plant is actually a shrub. Out of 300+ species of Plumeria, rubra is the best for growing indoors. You'll find plumeria for sale in spring and summer. You have quite a few cultivars to choose from -- in brilliant colors and dazzling combinations. 'Candy Stripe' has spectacular yellow-and-pink striped petals. Vibrant 'Hot Pink' is a popular cultivar. 'Cancun Pink' is soft pink and a prolific bloomer. Water: Keep soil evenly moist spring through fall. Water sparingly in winter, when plant is resting. Yellowing leaves are a sign of overwatering. Humidity: Moderate humidity. Place the pot on a tray of wet pebbles to raise the humidity around the plant. Misting is also a good idea in summer. 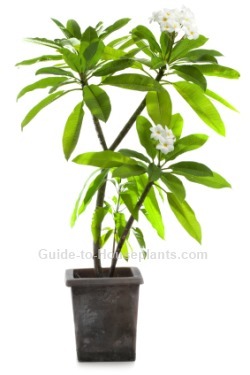 With plumeria care should be taken to mist the foliage, not the flowers. Temperature: Average to warm 65-80°F/18-27°C. It will tolerate high temperatures, but if you move it outdoors for the summer, bring it back inside if the temperature drops below 55°F/13°C at night. It's tropical, not hardy. Fertilizer: Feed spring through fall with high-phosphorus fertilizer to promote blooming. Propagation: Take 10 in (25 cm) stem tip cuttings in spring. Allow the cut ends to dry for 5-7 days, to prevent the sap from oozing out, before planting in potting medium.